You are cordially invited to a special conference exploring the life changing effects of Music Therapy. This event is open to all, SENCOs, parents, students, therapists etc. and anyone who is interested in learning more about this extremely important service. Truro Cathedral have a vacancy for a Boy Chorister to join the Truro Cathedral Choir from September 2019. Please see details and video below for more information. Congratulations go to Monty Manning who has been awarded the CMST Pupil of The Month Award for February 2019. Monty has been working really hard since then, and in January Anna suggested they work towards a Music Medal. “The home practice rate has certainly increased even more and the desire to earn a medal has really made Monty determined to work as hard as possible and he is enjoying his playing. Last week we worked on the skills options of the medal and Monty sailed through” Anna proudly tells us. Anna tells us she nominated Monty for pupil of the month because despite finding things difficult he has never given up and he now arrives at his lesson with a huge smile, excited to tell Anna about what he has practiced and he still manages to helps others in his group! Gareth Churcher, Head of Service for CMST, commented “This is a great example of perseverance. Monty, with the help and support of Anna, persevered through a challenging time in his music learning. It is always the easy option to give up when things seem hard. By changing his instrument, Monty has found a new love for his music making. The weekend is open to adults and students - some teachers might come away with some new ideas for teaching recorder.....good opportunity for meeting other recorder players! ALL students are invited - whatever their level - there are playing workshops, art and music workshops, exploring different types of recorders etc. 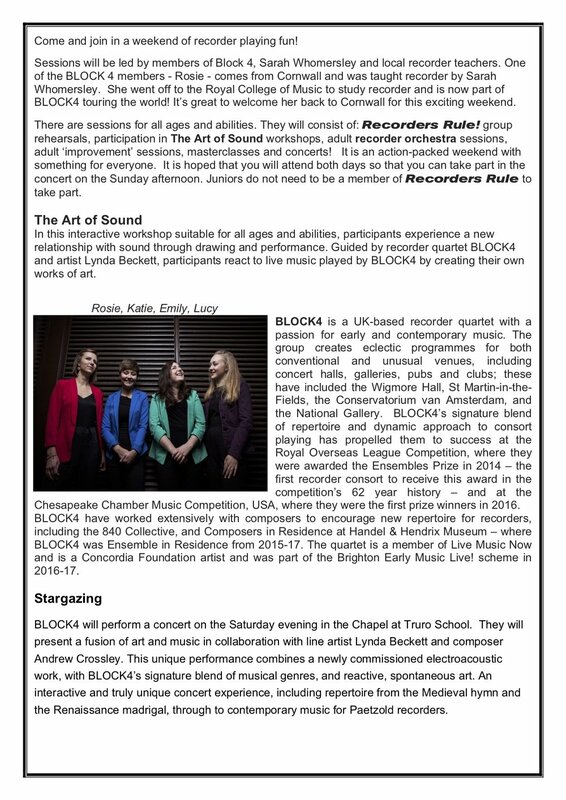 BLOCK 4 recorder quartet are an award winning ensemble who travel the world - they are running some of the workshops and performing a concert on the Saturday evening (tickets available on the door). One of the members of BLOCK4 comes from Cornwall - went to Cusgarne Primary and Richard Lander School, played flute in Carrick Winds and learnt recorder with Sarah Whomersley. Congratulations go to Jonah Woods who has been awarded the CMST Pupil of The Month Award for January 2019. Jonah is currently working towards his Grade 5 exam which he hopes to take in the summer. This is a very high standard for someone in year 7 to achieve. Jonah is a keen and committed member of Caradon Strings and has been so for several years.